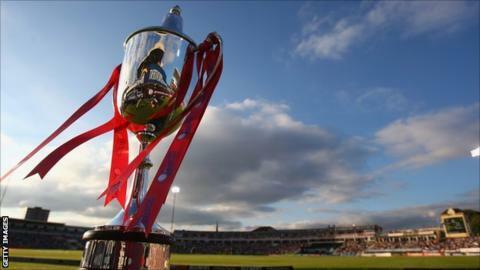 Gloucestershire may rebrand themselves as Bristol for the T20 Blast. In an end-of-season questionnaire, supporters are being asked if the change would make them more likely - or less likely - to attend matches. Warwickshire are the only first-class county to play under a different name - Birmingham Bears - in T20 cricket. "We just wanted to put it out there to get people talking about it. This issue comes up again and again," club chief executive Will Brown said. Gloucestershire are based at the County Ground in Bristol, with Cheltenham the only other venue in the county currently used for matches. "We want people's suggestions and opinions," Brown told BBC Radio Gloucestershire. "I'm not sure how it would change Gloucestershire - but other counties have done it. "I would be extremely surprised if it happened, though. We have a unique problem in that we've been playing in Bristol for 126 years and I don't think there is enough awareness of that. "My natural inclination and gut feeling is that it shouldn't change - but we'll see what the fans have to say. Ultimately, we are a membership society and members have the final say." Glamorgan rebranded themselves as Welsh Dragons for limited-overs cricket in 2012, but reverted to their county name for all forms of the game after only one season.